Many people know that they have an annual ISA allowance, but how can you get the most out of it? Here are 5 simple ways to get the most out of your ISA allowance for the new tax year and those to come. To get the most benefit from your annual ISA allowance, the first thing is to make sure you subscribe your cash as early in the tax year as possible. While making regular payments into your ISA over the course of the year can be one way to invest or save, it might not be the best way. If you are fortunate enough to have a lump sum available at the start of the tax year, then it could make sense to subscribe your full allowance as early in the tax year as possible. This way you will earn the maximum amount of tax free interest on your savings. This might not work out quite as well with Stocks and Shares ISAs, however. This is simply because the value of investments can rise as well as fall, so investing at the wrong time might lead to a fall in the value of your investments. Our next tip for getting the most out of your ISA allowance is to start investing or saving from a young age. It’s important to remember that your ISA allowance does not rollover each year. This means that every year you allow to pass by without using your allowance will effectively mean you lose the potential for maximum tax free returns over your lifetime. Simply put, the earlier you start to save or invest, the better. Another tip is to take some time to get to know the different types of ISA. Some ISA types carry greater potential returns than others, but may carry more risk. Some also offer annual top-up bonuses from the government. While Innovative Finance ISAs like those from easyMoney, Kuflink and RateSetter allow you to get involved with peer to peer lending. If you want to make the most of your ISA allowance it is worth researching the different types of ISA on offer, with the aim of maximising your returns. Review Your Regular Payments… Regularly! When you first sign up for an ISA, many providers sell the ease of being able to ‘set and forget’ your regular investment amount. While this is great in some ways – as you can regularly save or invest without really noticing it – it’s also important to review your payments from time to time. One major reason for reviewing your regular payments is that your annual ISA allowance can change from year to year. This means you may be allowed to save or invest more annually than you could previously. Another reason you might want to review your payments is that your salary may also increase over time, so you may decide you can invest more now that you’re earning more. The effects of inflation can also mean that you are saving less than you thought in real terms as time goes by. You may want to increase your regular contributions to account for this. We should say that some ISA providers do allow you set inflation-adjusted payments automatically. Our final tip is to not be afraid of transfering to a new ISA provider when it makes financial sense to do so. In the same way that you need to review your regular payments from time to time, it also makes sense to review your ISA provider from time to time. Just because your ISA provider offered the best value when you first set your ISA up, doesn’t mean that they’ll still offer the best value today. Have their fees or interest rates changed making them less competitive? Have new players entered the market who now offer better value? Or, have new ISA types come to the market which offer more attractive returns? If any of the above are true, then it could make sense to transfer your ISA to another provider. The process of transferring an ISA is usually pretty simple and any hassle might be well worth it. Just be sure to check if your current ISA provider charges any exit fees before you transfer, as this might make a transfer less worthwhile. ISAs can be a great way to save or invest over a short or long term period. This is especially true if you make full use of your ISA allowance to get the maximum benefit. 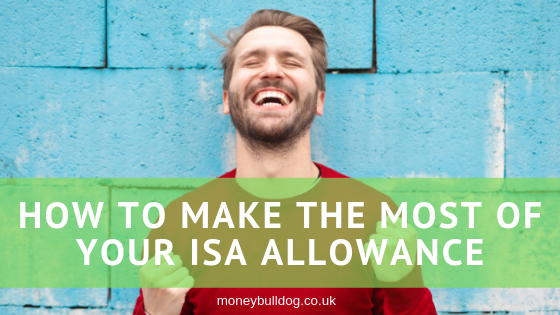 Hopefully this post will have given you some neat tips to help you get the most out of your ISA allowance. ‘With investment comes risk and you may get back less than you invest’. What Is the ISA Allowance Cut Off Date? What Is the Junior ISA Allowance? Just Over 24 Hours Left to Use Your ISA Allowance!